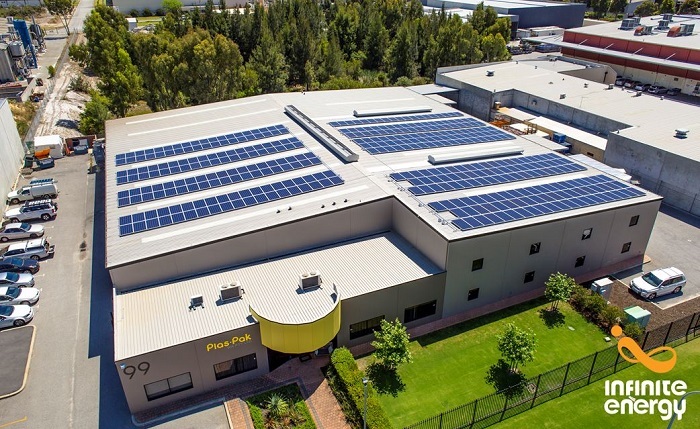 Infinite Energy recently completed the installation of a 100kW solar PV system and energy monitoring system for WA based plastic manufacturer Plas-Pak. In addition, Plas-Pak also contracted with Infinite Energy for their grid supplied electricity. 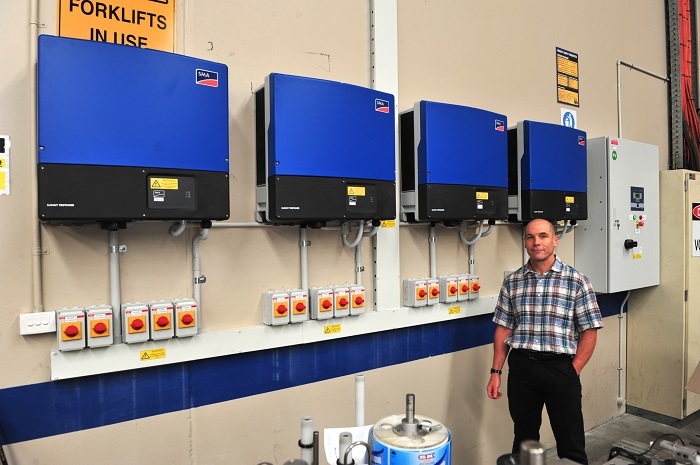 Managing Director, Stephen Kiss, certainly did his research before deciding if solar was a viable choice for his business. In this interview Stephen tells us about his journey and explains the company’s motivation for choosing to invest in solar. Stephen also shares the lessons he learned along the way and gives his key advice for other businesses who may be considering solar for their business. Let’s begin with an introduction to Plas-Pak. What does the company do? 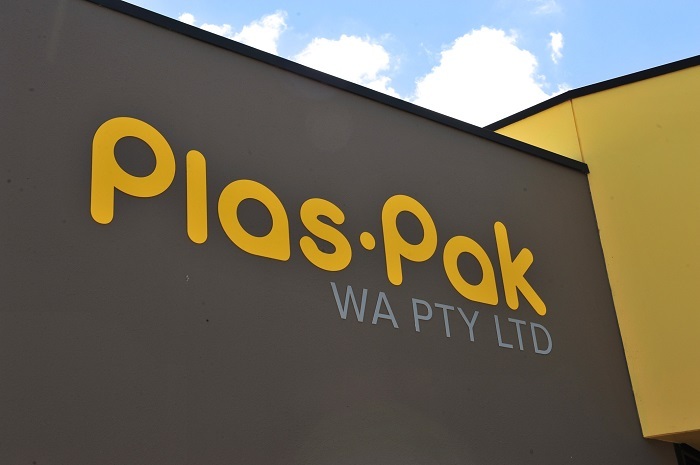 Plas-Pak (W.A) Pty Ltd is a plastic manufacturing and packing company based here in W.A, and we’re involved in the manufacture of both blow moulded and injection moulded products that we supply throughout Australia. This includes the Eastern Seaboard and as far as New Zealand. We supply a multitude of industries ranging from the mining and resources industry, agriculture, through to pharmaceutical, dairy, as well as a number of specialized industries that require custom manufactured products. We supply any industry that needs to package any form of liquid or powder products. Can you briefly describe the company’s key objectives and key goals? We have a number of strategic objectives. Firstly we want to have happy customers. Secondly we need ensure that we have a positive impact on our environment and satisfy shareholders. The mission of the company is to really be seen as a strategic partner to our customers, and not merely a supplier of their packaging requirements. In order to achieve this, we have a number of key initiatives and objectives that we follow. We want to make sure that we have competitive pricing and we want to make sure that our products are of superior quality. Furthermore we will provide an outstanding service, and a healthy environment that is safe, empowering, and satisfying, and a place of physical, mental, as well as personal well-being that supports optimum health and safety for the employees of the company. These driving initiatives ensure the success and profitability of the organisation, resulting in satisfied business partners, happy employees and shareholders. We also believe that part of our key objective is to be held accountable to the environment, and to reduce our carbon footprint. What is your role within Plas-Pak? My role in the business is to ensure that we maintain our focus and direction, and to ensure that the company remains competitive in a very dynamic environment without compromising customer service, product quality, and the safety of our employees. I take a very active and hands-on role in the business by managing these key objectives and the strategic direction of the company. You’ve talked quite a bit about the environment. Is that when you first considered that solar might be a good idea for Plas-Pak? Was it part of your environment initiatives or was it more of a financial decision? Or was it a combination of both? It’s quite a combination, actually. Plas-Pak has always had a personal responsibility to our environment. We belong to the APC, which is the Australian Packaging Covenant, which is an initiative by the Australian government. All signatories to this covenant have to demonstrate that they are actually following certain initiatives to reduce their carbon footprint. We knew if we were going to make such a substantial investment, it was important for us to make sure that we tick off the social responsibility to the environment, which is part of one of our key objectives for the business. Did you look at any other options besides solar, or was solar the clear choice? We looked at a number of initiatives from things like power factor correction, and looking at using more energy efficient ways of utilising our power throughout the organization. We had quite a substantial checklist to see which option we wanted to go for, and how that aligned with the strategic direction and objective of the business. Solar checked most of the boxes, and that’s the reason why we decided to go down that avenue. You said solar checks a lot of the boxes, so what was the selection process? What were the boxes that solar had to tick? Well, looking at the return of the investment was obviously quite a big one for usbecause it’s quite a substantial investment. Another one was what type of impact would it have on the daily operation of the business. What I mean here is, would the business have to stop at any point in time for the solar to be commissioned? Another one that came out of the process we went through was we looked at what government incentives were available for implementing certain forms of power saving, power initiatives and so on. Then again, as I mentioned earlier, what type of impact was it going to have on the environment and what message would it be sending out to the market. So as part of this process you also switched electricity supply to Infinite Energy. Did you follow a different selection process? If so how did that one differ? It was very similar. 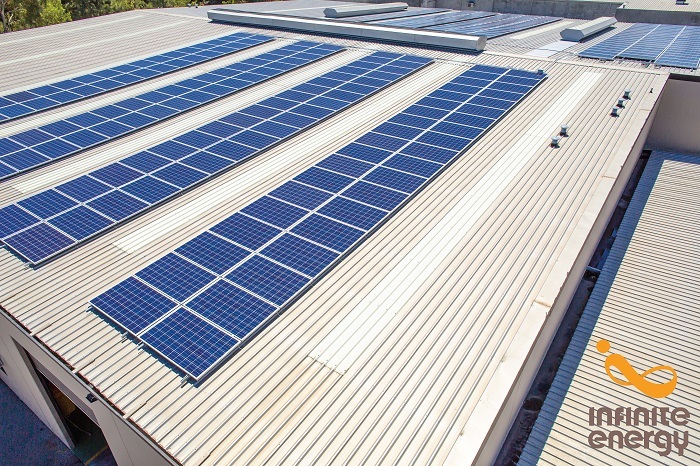 We went out to tender on the national market in Australia for both the supplier of solar, and retail energy supply. At the end of the day Infinite Energy presented the most attractive package that included both solar and the grid-electricity supply. Going through the process … I’ve been dealing with Infinite Energy now for two and a half years, and making the decision to go with Infinite Energy for both the solar and the retail energy … We had a lot of confidence in dealing with the business, dealing with certain people at different levels in the company, and that’s the reason we decided to go with Infinite. I think if it wasn’t Infinite Energy the retail energy would’ve been supplied by an external party, and the solar would’ve been completed by Infinite. 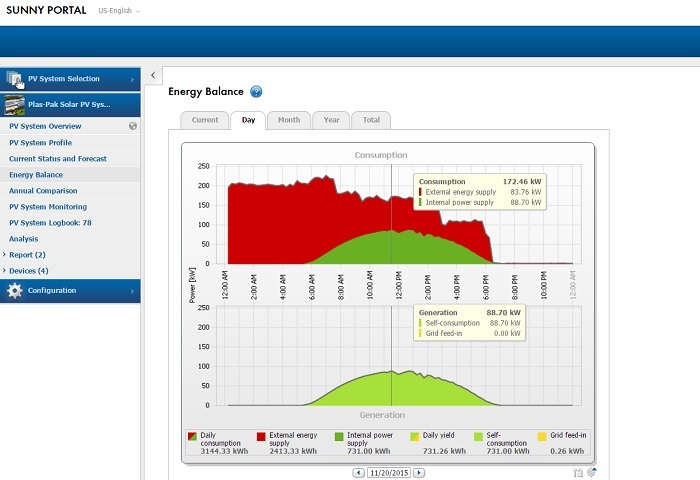 Do you think there’s a benefit in having both your grid supplied and solar through the same supplier? Yes in this instance I certainly think there is because Infinite clearly understood what Plas-Pak wanted to measure and monitor. Their monthly bills also come out with certain amount of information that’s valuable to Plas-Pak. They’ve become quite au fait with the expectations of Plas-Pak, and moving forward onto solar. The company has the resources to assist Plas-Pak in further reducing our bills. You touched on the monitoring there. Can you tell me a bit about the monitoring system that you’ve had installed, and what this means for you and your business? This was a really important criteria for the business. We believe that if you can’t monitor it then you can’t manage it. We have a specific criteria that we have set up for ourselves in order to have better control over the utilization of our power; when we use it, how much we use, how much we draw from the grid, what time of the day or night we draw from the grid, and so on. Infinite Energy came up with a real solution based on the expectations of the business. And you have an alert function that notifies you if your usage goes over a certain amount? Yes. The system we’ve designed together with Infinite is that there’ll be certain upper and lower limits set, and alerts will then be sent to key people through SMS and e-mail once those system limits are reached. So ultimately you hope that’s going to help reduce your running costs? Oh, absolutely. Electricity contracts are usually negotiated on a two year or three year basis, and the value of the contract is based on historical data. Retailers usually look at four peak days in the year, usually when it’s the hottest and people are using the most power. The retailer then looks at the data to say, well if this amount of power had been used over that period, and they need to make sure that they can accommodate and have power available to that amount for the business. Plas-Pak can monitor what we do especially on the “hot” days and the four peak days we have measured, so we can negotiate better rates in a year and or two years’ time. So using it to lower your capacity charges? Absolutely. Also, power is far more expensive during peak than off-peak hours. We only want to draw the minimum from the grid during peak times. So going back to the solar, what were your main concerns and objections to installing the system? How did you overcome them? Our main concerns were timing to ensure that solar was up and running by the summer. We have lovely weather starting in November and December, and we really want to make sure that we realised the return on our investment earlier rather than later. That was our major concern and the way that was overcome was that Infinite Energy were great in closely monitoring and project. Managing the process and keeping the business informed every step of the way as milestones were being reached on what’s being done and how long it’s all going to take to complete the project. What would you say the key lessons you have learned throughout the journey are? From your initial realisation that solar could be a good idea for your business all the way through to installation, what were the key lessons you learned throughout the journey? It was a long journey to be quite honest, two and a half years from when we embarked on educating ourselves and then making the final decision. The key lessons are, one needs to acquire a sound knowledge of solar, and the type of system you want to install, then you need to make sure that you align yourself with a reputable and reliable supplier. This all contributed to the strategic objectives of the business, and in order to remain competitive in a very competitive environment, I think it’s important to have that knowledge. As they say, “Knowledge is power.” It’s really important. What are you hoping that the solar system is going bring to Plas-Pak? What benefits, what are you hoping in terms or savings, and is that going to help you stay competitive in your business pricing? The business expects there will be annual savings of about 30% for us based on the current contract terms, if we were to monitor and use the monitoring system effectively, it could be substantially higher than that which will make us more competitive. From the research we have done Plas-Pak is going to be the only plastic company of our size using the amount of solar that we do in the southern hemisphere. That really differentiates us from all of our competitors, it just puts us outside the box of all the other plastic manufacturing companies, that’s really great for us to differentiate ourselves in the market. It gives us a positive spin off looking at how much we’ve reduced our carbon footprint by utilising solar. I guess it’s quite a big visual statement as well. A lot of environmental initiatives, there’s nothing to show for it, but this one’s quite an obvious visual mark that you are doing something for the environment. Absolutely. And that’s something that again, with the monitoring system, it’s actually something you can measure because we know how much carbon we’ve put out for the last five, six, seven years. We can go back in two or three years’ time, and say, “Well this is what it’s actually reduced by, and that’s solely because we’ve implemented solar.” Certainly something you can measure, and it’s quite tangible. You mentioned that it was actually quite a long journey for Plas-Pak to make the decision, but how long did the actual installation of the system take? From when we signed the contract, until the monitoring system being installed, you’re actually looking at about six months. Yes approvals and so on, exactly. Installation was over two weeks, really, but from when we signed the contract until everything is ready to go, I’d say about six months. So did the installation process on site impact your business operations in any way? You mentioned that you were worried and this and that it was a factor when you went through your selection process. No we made sure that there would be no effect to the business. We’re on a continuous operation here, so there was absolutely no impact at all. Overall how would you summarise and describe you experience? Well Infinite Energy has been absolutely superb from when I first dealt with them, which was two and a half years ago. They were professional in their manner, I found that they have a wealth of experience, and they were more than happy to share the knowledge that they had. That obviously allowed the business to make the right decision to go with solar, and I can honestly say that at this point in time, we really feel we’ve made the right decision in choosing Infinite Energy to supply the solar PV. If you had to give a key piece of advice to another business that was looking at investing in solar, what would it be? I think a couple of pointers … One needs to ensure that you have the sufficient or right amount of knowledge on the size and type of solar system you want to install. You need to be certain on that which you want to measure and monitor. That’s really important if you’re serious about power consumption. Finally, choose your supplier carefully, and I’d say one that has a proven track record. We’ve had a really good experience, it has taken us longer than most companies would take to make the decision, but it was a thorough decision. I can honestly say the team at Infinite Energy has been absolutely superb.